Does this really need any description? Inspired by the cloak of one of *the* goth icons, our Lily Munster Cloak is a sweeping, epic Moonmaiden (re)production of this stlyish classic! <br> <br> It's made from Gunmetal Taffeta and black steamed velvet, which sounds a lot simpler than it is! There is soooo much gathering in the cloak that you simply won't believe it! Every panel and fold is lovingly hand-gathered to create that Munstery vibe! <br> <br> The roomy hood is similarly gathered; then there's the handy holes in the cloak itself (handy for poking your hands through hehe!) which are trimmed with braid; and the entire front of the cloak is also braid-trimmed from the top of the hood all the way to the hem! And finally, the cloak fastens under the neck with an antique pewter effect metal clasp!<br> <br> If you wanted something a little different we can also make the cloak in any of our taffeta shades - see the options below! <br> <br> The iconic goth cloak. Make it yours! Does this really need any description? 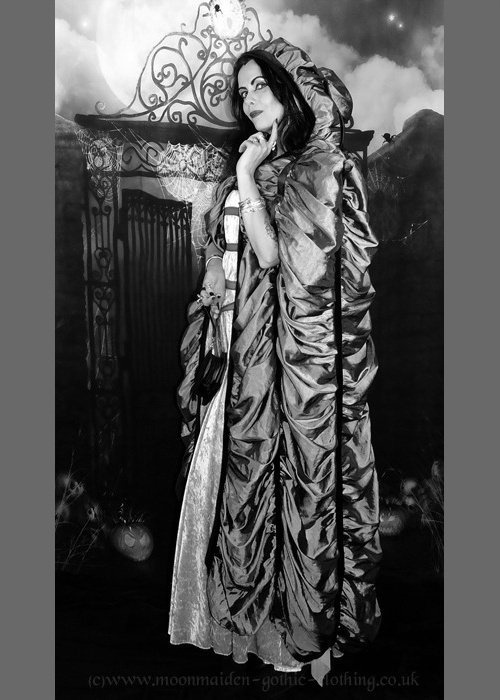 Inspired by the cloak of one of *the* goth icons, our Lily Munster Cloak is a sweeping, epic Moonmaiden (re)production of this stlyish classic! It's made from Gunmetal Taffeta and black steamed velvet, which sounds a lot simpler than it is! There is soooo much gathering in the cloak that you simply won't believe it! Every panel and fold is lovingly hand-gathered to create that Munstery vibe! The roomy hood is similarly gathered; then there's the handy holes in the cloak itself (handy for poking your hands through hehe!) which are trimmed with braid; and the entire front of the cloak is also braid-trimmed from the top of the hood all the way to the hem! And finally, the cloak fastens under the neck with an antique pewter effect metal clasp! If you wanted something a little different we can also make the cloak in any of our taffeta shades - see the options below! The iconic goth cloak. Make it yours!